The Crested Butte Titans boys’ basketball team stunned the Creede Miners, handing them a 41-39 loss on Friday, December 14 in front of the Miners’ hometown crowd. 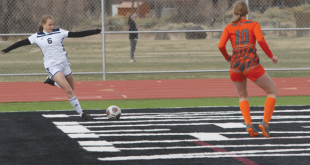 The win was especially sweet because the Miners defeated the Titans three times last year, including in the post-season, leaving the Titans one game shy of reaching the state tournament. “They sent us home before we were ready to go home,” says Titans head coach Robin Loyed. Aware of Creede’s strong starting line-up, Loyed decided to open the game with a man-to-man defense. Unfortunately, the plan suffered in the opening minutes of the game as the Miners built a 10-0 lead. Loyed called a time out to regroup the team and the Titans responded, tripping up the Miners’ offense with a stifling half-court trap. The new defense forced several turnovers, allowing the Titans to reel Creede in and eventually take a one-point lead into halftime. “We clawed our way into the lead,” says Loyed. Creede did some rehabilitation of its own during the halftime break though, and came out in the third quarter to build an eight-point lead. Despite poor shooting from the Titans all game long, their defense remained tough, accented by an oppressive full-court-press that handcuffed the Miners at the close of the third quarter and into the fourth quarter. Down three points in the fourth quarter, the Titans made their final move in the closing minute of the game. Junior Robbie Holleran pulled down an offensive rebound and scored to cut the Miners’ lead to one. Senior Randy Evans stole a Creede pass on the next possession and scored to give the Titans a one-point lead and the Miners fouled senior Joe Bosshard with 45 seconds to go. Bosshard hit one of his two free throws to put the Titans up 40-38. Creede set up for a game-winning three-point shot but the attempt clipped off the rim and senior Will Curry pulled down the rebound. Curry was fouled with one second to go and hit one of his two free throws to ice the 41-38 Titans win. Unfortunately, the Titans’ poor shooting from the field continued in their game the following day, while their opponent Cotopaxi couldn’t miss. Cotopaxi shot 90 percent from the field in the first quarter but the Titans managed to hang on, down just four points. 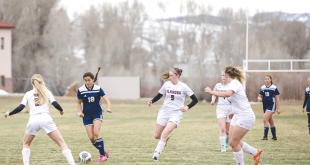 Trouble hit hard for Crested Butte in the second quarter as Cotopaxi opened up an 11-point lead by halftime. While the Titans played even with Cotopaxi in both the third and fourth quarters, they were too far behind to make up any ground, eventually falling 61-49. "We dug a hole in the first half and couldn’t get ourselves out of it," says Loyed. "It was the third straight game we haven’t shot well." Junior John Wright led the Titans, scoring 23 points and Holleran had a break-out performance on the boards, pulling down a team-leading 12 rebounds. Evans joined the two in both categories, scoring eight points and pulling down eight rebounds.